Full Tilt accepts all players from all locations, except the United States of America. Full Tilt is the second largest online poker room and competes head on with pokerstars, with terrific traffic, ample game selection and extraordinary high stakes games. Full Tilt offers the best poker playing enjoyment you could ask for, including a nice poker bonus, perks, VIP programs and promotions, but one thing that no other room has is their nosebleed high stakes games. 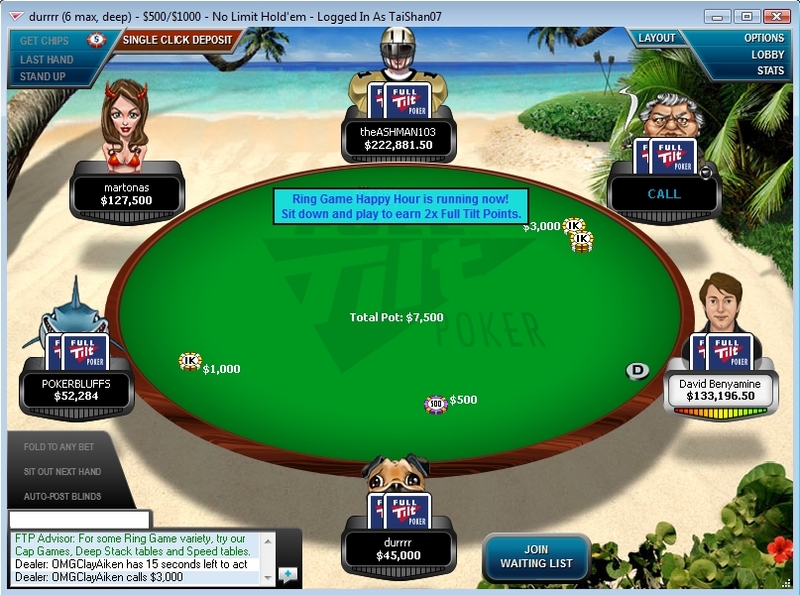 Below is a picture of the Full Tilt lobby and one high stakes table. You can enlarge them by clicking on them. The high stake table above is quite interesting. This is a no-limit texas holdem short-handed cash game table with blinds $500/$1000. So just to sit there costs $1500 per rotation and the standard 50 big blinds stack is a cool $50,000. What is also interesting is that there are three famous poker pros at this table: David Benyamine, Phil "OMGClayAiken" Galfond (old lady avatar) and Tom "durrrr" dwan. Just after the image was shot, durrrr reraised allin with Ako and was called by OMGClayAiken with AQo. As no one improved, durrrr earned a cool $50k in a few seconds, but this is a small pot for these high stakes ring game players, as the largest pots (usually in PLO) can almost reach one million dollar. These high stakes games are a nice feature within full tilt and you can spend some time observing and learning from a big team of poker pros. But except that, the poker room has all attributes to be considered one of the best online poker rooms. In NLHE, micro stakes games start at 2 cents BB, and there are dozens of active tables (heads-up, short-handed and nine-seated) all the way up to NL400. Beyond that are the high stakes tables with great action. The top ones are NL100k and are named "durrrr", "GusHeaven", "RailHeaven" and "Ivey Heaven". Similarly fixed limit Texas Hold'em games are very active with hundreds of active tables at all time. PLO is getting very popular and there are always a few hundred tables running at all stakes levels, including high stakes such as $50 BB. 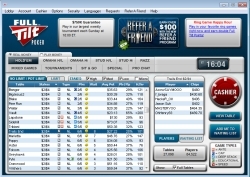 You can even find good action in less common games like Omaha Hi-Lo, Stud, Stud Hi-Lo and Razz. Full Tilt is famous for its tournaments and they come in all shades. Every five minutes one or more tournaments start, in holdem, omama, HORSE or HOSE. Buy-ins range from the numerous freerolls, then the low buy-ins of $0.60 or $1, a multitude of tourneys between $1 and $10, many more from $10 to $109, and finally the large buy-ins around $500 or $5,000. With respect to the software at full tilt, there is nothing to complain about and it is a lot of fun to use it, with nice graphics and all the necessary functionality. Use our exclusive bonus when you sign up at Full Tilt and you will get a first depositor bonus of 100% up to $600. 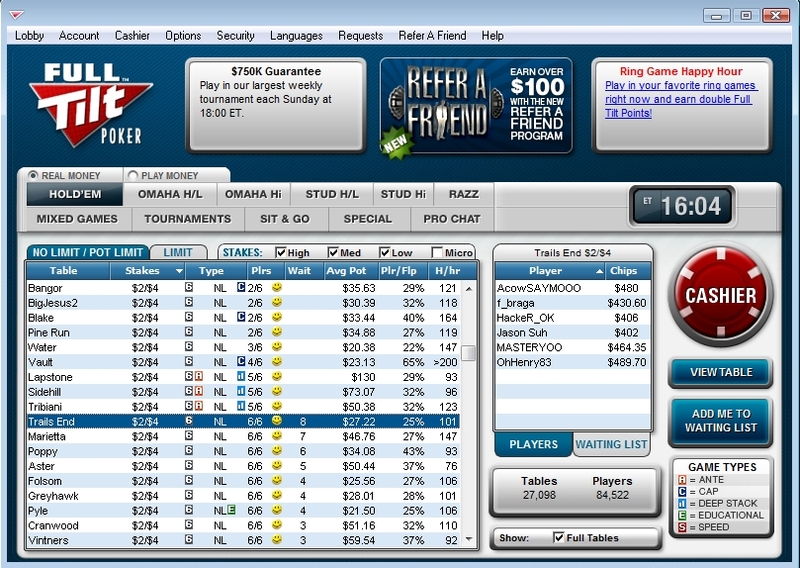 Full tilt is on top of the online poker industry and they are of of the favorite rooms for online pros. There is nothing easier than getting a free $600 as good as cash if this is your first time playing at Full Tilt. Just use our link when you register. After downloading Full Tilt software, install the program, run it and select "Create New Account". This will fetch a window. Fill all the information and you are ready to play. You are ready to make a deposit and to play in real money games. Optimally you should deposit exactly $600, so that you get the maximum allowed full tilt bonus of $600. There is no risk and your money is safe as millions of players already have an account at FT.